Horror movie by Noriaki Yuasa from 1969. 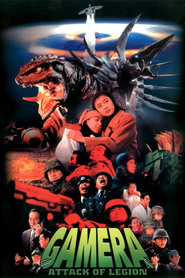 Aliens kidnap two children and take them to another planet for the purpose of getting knowledge from their brains, but Gamera follows and tries to rescue them. Gamera vs. Guiron (Gamera tai Daiakujū Giron, lit. Gamera vs. Giant Evil Beast Guiron) is a 1969 kaiju film directed by Noriaki Yuasa. It is the fifth entry in the Gamera film series.